UTSA South-West Texas Border SBDC Network will honor area Small Business Week awardees and will offer educational and lender networking sessions for entrepreneurs. Every year since 1963, the President of the United States has declared National Small Business Week to recognize the important role and contributions of America’s small businesses. This year, National Small Business Week takes place from April 29 – May 5. In partnership with the Small Business Administration (SBA) San Antonio District Office and the UTSA Institute for Economic Development, the South-West Texas Border SBDC Network will highlight the national event during an educational business forum and awards presentation, which will recognize regional entrepreneurs for their achievements, including individuals and organizations who champion small business. A full list of winners is listed below. The business forum will include eight dynamic small business trainings taught by industry leaders focused on digital advertising, social media marketing, small business financial practices, and SBA resources. Additionally, a networking session will connect entrepreneurs who are interested in accessing capital with active SBA lenders and other business support providers. WHEN: Friday, May 4, 8:30 a.m. – 1:30 p.m.
“National Small Business Week continuously highlights the significant role of business owners and entrepreneurs within the nation’s growing economy. 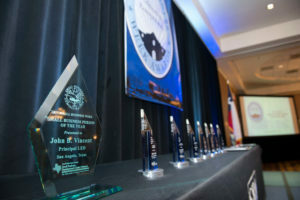 The “Connecting Business with Opportunity” event demonstrates both UTSA’s and the Network’s interest in not only highlighting the successes of the awardees but enriching our business community with new knowledge. We congratulate the 2018 San Antonio Small Business Week award winners for their commitment to growth and impact on the Texas economy,” said Al Salgado, executive director of the UTSA South-West Texas Border SBDC Network.